Cats, as you know, have whiskers. They have those long, really noticeable whiskers on the sides of their face, but they also have less standout-ish whiskers above their eyes, under their nose, on their chin, on the backs of their cheeks, and even on the back of their front legs. Read on for a quick look at a cat’s wonderful whiskers. Whiskers are a type of hair found on cats and other mammals. Officially called “vibrissae,” whiskers are significantly stiffer than a cat’s other hairs, as well as being bigger around. Many whiskers are also significantly longer that a cat’s other hairs, too. Beneath the skin, whiskers have special follicles that are larger, deeper, and much more sensitive than other hair follicles. Whiskers are extremely sensitive to the slightest touch and send unique, identifiable signals to the brain. 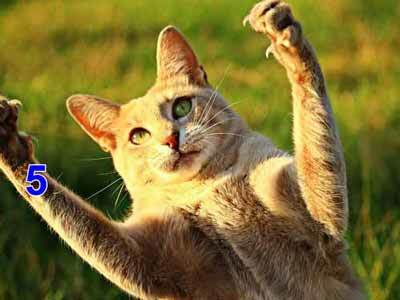 They are so sensitive that even subtle movements in the air reflected off of objects around them sends information to a cat. Even though we call human facial hair “whiskers,” it’s really just hair. As in normal hair, not extra-sensitive whisker hair. All whiskers are, well, whiskers, but depending on where they’re located they also have more specific names. Mystacial Whiskers – These are located on a cat’s face on either side of its nose. They fall into two different groups: 1) The large mystacial whiskers point out to the side and are often quite showy. Of all a cat’s whiskers they’re probably the best known and the most noticeable. 2) There are also smaller, shorter mystacial whiskers located beneath the other ones. These mostly point downwards instead of out to the sides. Superciliary Whiskers – These are above your cat’s eyes, and look like little tufts at the inner edge of the eyebrows. Genal Whiskers – These are found on the back of a cat’s cheeks. Mandibular Whiskers – These whiskers are located on a cat’s chin. Carpal Whiskers – Whiskers aren’t just located on a cat’s face: Carpal whiskers are located fairly low on the back of each front leg. 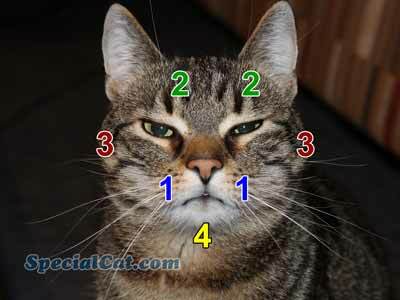 The numbers show the location of this cat’s whiskers. Cats also have carpal whiskers. They’re a bit difficult to see: Look just to the right of the number five. Whiskers can help our cats brilliantly navigate in extremely low light. Whiskers can not only feel objects, they are so sensitive that they can feel air movement around objects. Superciliary whiskers (located above the eyes) and genal whiskers (located at the back of the cheeks), can trigger an automatic eye blink when touched. This is a protective mechanism to help our cats prevent eye injuries when prowling through grass or brush, or when playing or fighting with toys or other animals. Carpal whiskers (located on the back of the front legs) help a cat receive feedback on an item its touching with, or holding in, its paws. The long mystacial whiskers (on either side of a cat’s nose) point to the sides and sweep in all kinds of information whether they actually touch an object or feel movements in the air. The shorter mystacials beneath the long ones mostly point downward, and give a cat information about the blind spot beneath its nose. For these and many other reasons whiskers are an indispensable, integral part of our cats’ sensory experience. This cat’s mystacial whiskers can feel the mouse in his mouth. Cats can control the movement of some of their whiskers. For example, they can push the large, long mystacial whiskers on either side of their nose forward or backward. They might push them forward to act kind of like a satellite dish scooping in the signals around them. Or, they might flatten them toward their face to keep a strong wind from blowing them, or to protect them when playing or fighting. Whiskers have a growth cycle just like other hairs on a cat. (If you’ll remember from the top of this page, whiskers are hairs. Special hairs, to be sure, but hairs.) Even though their growth cycles aren’t seasonal like other hairs on a cat’s body, whiskers do have a cycle where they emerge, grow to maturity, then, in time, fall out to be replaced by new ones. So, if you find the occasional shed whisker on the carpet it’s probably all part of a its natural lifecycle. Some cats experience whisker stress when eating or drinking out of certain bowls. To learn about whisker stress (what it is, how to recognize the symptoms, and what you can do about it), please see this page: Cat Whisker Stress. 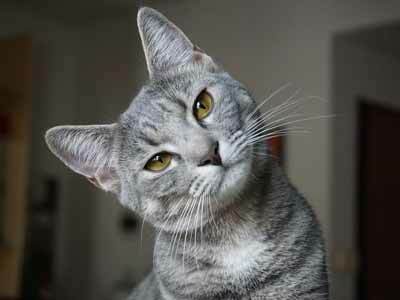 For some reason, some cat owners feel the urge to trim their cats’ whiskers. Even though trimmed whiskers do grow back there’s no reason to trim them, and doing so can be detrimental to your cat. Your cat is constantly using the information their whiskers send to their brain and depriving them of this information can cause your cat confusion, uncertainty, loss of equilibrium, and stress. The information whiskers provide to your cat isn’t “extra” or “bonus” information: Your cat needs its whiskers for normal, crucial, every day information to navigate its world indoors or out.